In Czech Farm, Fernie, B.C., A.Y. Jackson confirms his talents as a painter of environments, both built and natural. The farmwife tending chickens gives context to the scene, but otherwise seems a peripheral element in the painting. In contrast, the striking hayloft, which evokes the grain elevators of Jackson’s Elevator, Moonlight and Elevators At Night, Pincher Creek (both c. 1947), maintains a vibrant visual presence. With it, Jackson seizes the opportunity to echo the dynamic verticals of the hills beyond. Curves and contours play out energetically in the background and foreground—where “culture” is taken over by “nature.” The painting’s palette shares the brilliant yellows and deep ochres of Vincent van Gogh’s Post-Impressionist canvases. 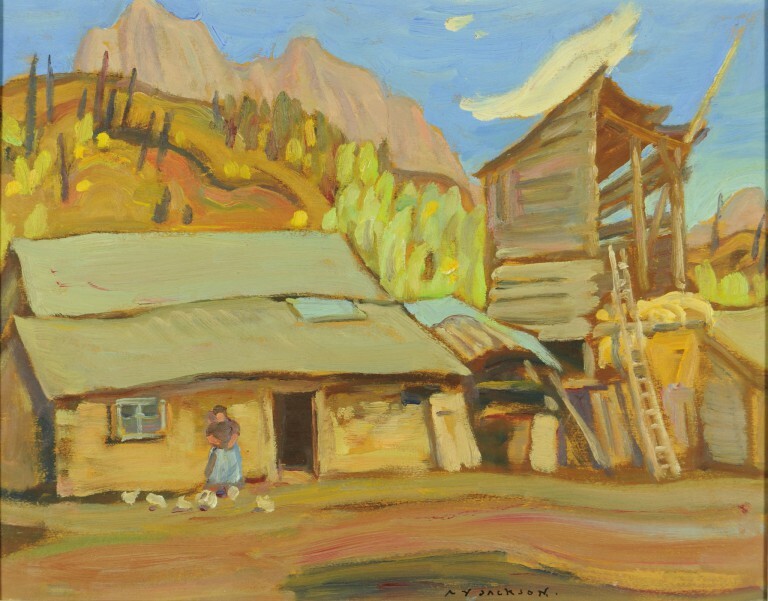 Jackson’s approach to the human figure in Czech Farm, Fernie, B.C. resembles that found in his paintings of rural Quebec and of native communities in the Canadian Arctic and B.C. interior. In each work, he documents a human presence but devotes more visual space to the surrounding buildings and landforms. Given Jackson’s strengths as a self-professed “landscape man,”1 it is understandable that he had struggled with his first assignment as a Canadian war artist: to paint a portrait of Corporal Kerr, V. C., of the 49th Battalion. However, Jackson’s depictions of bombed cathedrals and ruined houses would provide some of the most powerful representations of the Great War. 1. A.Y. Jackson, A Painter’s Country: The Autobiography of A.Y. Jackson (Toronto: Clarke, Irwin), 1958.